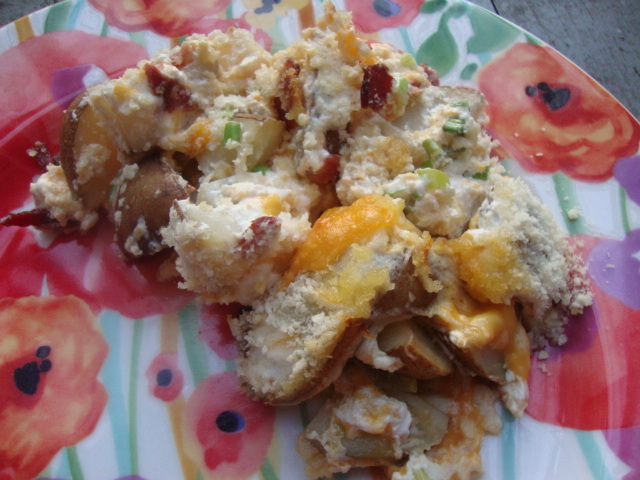 I will be honest that I created this recipe as an effort to lighten up the crowd-pleasing but heavily-caloric dish of “Party Potatoes.” I subbed in Greek yogurt for sour cream, cut back the cheese, and tried to amp up the flavor by roasting the potatoes and adding in bacon. The result was delicious but it didn’t really taste like Party Potatoes. In fact, it reminded me of something else entirely – a loaded baked potato, on steroids. And so a new dish was born; a super-tasty, not too unhealthy dish. Serve where ever you’d serve a baked potato. Preheat oven to 400 degrees Farenheit. Prepare a cookie sheet and an 8 x 8 inch casserole dish with baking spray. Place chopped potatoes on prepared sheet and season with salt. Bake 40 minutes. Place roasted potatoes in a large mixing bowl. Set aside approximately 1 Tbsp each bacon, cheese, and green onions. 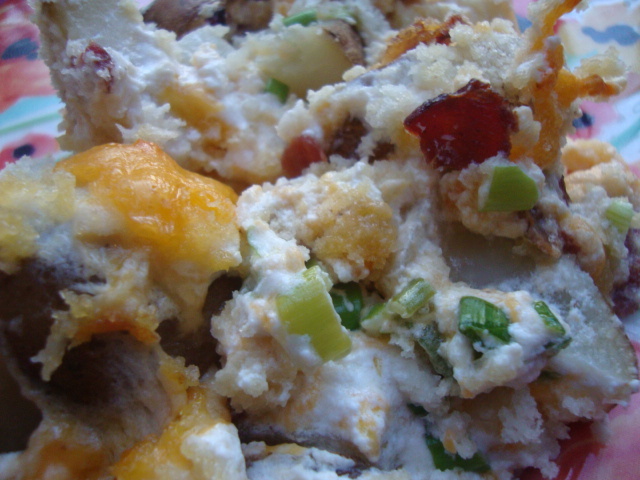 Add Greek yogurt and remaining bacon, cheese, and green onions to the potatoes. Stir to combine. Pour potatoes into the prepared casserole dish. Top evenly with panko breadcrumbs and reserved bacon, cheese, and green onions.